Wide curved entry steps, deep recliner and sculpted massage seats, open barrier-free fitness area, patent pending dual prop propulsion fitness stream for the widest, smoothest most balanced workout in the industry. 18 hydrotherapy stainless Reflections Jets™ for shoulder, upper and lower back, and calf hydrotherapy. This very popular 17’ TruSwim® model is the perfect fit for anyone striving for a healthier lifestyle. The patent pending dual prop technology offers an unmatched aquatic fitness stream with balance, width and resistance for athletes, fitness enthusiasts and those seeking a healthier lifestyle. "TruSwim® is designed so that someone enjoying the therapy seats is not subjected to the fitness current. Makes for an enjoyable relaxation time." SWIM AND FITNESS SPAS. RENEW, RELAX, REPEAT. 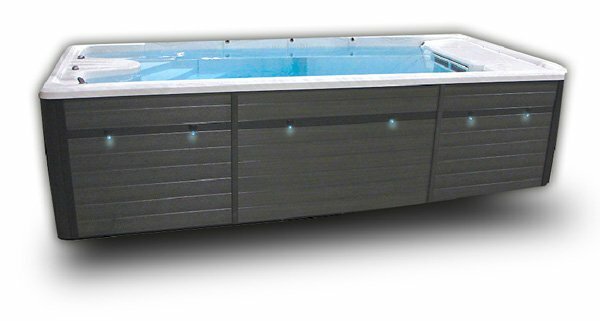 Our collection of swim and fitness spas are the pinnacle of performance and style providing improved wellness and a better quality of life conveniently at home. With a PDC Spas swim or fitness spa just footsteps away, you can achieve your personal health and exercise goals with the added resistance of our TruSwim® dual propulsion hydraulic, superior jetted swim or fitness currents. With a variety of lengths, current styles and exercise features, your spa is customized to fit you and your home. Simply swim, run, walk or perform your favorite aquatic exercise on your own schedule and enjoy your improved lifestyle.